NBC’s Chicago Fire has added a new, pretty cast member. As if we needed another reason to tune in, the firefighters of Firehouse 51 have adopted a rescue puppy to be their station’s mascot. Tonight’s episode will introduce the new four-legged cast member, Pouch, who will be a regular on the show. 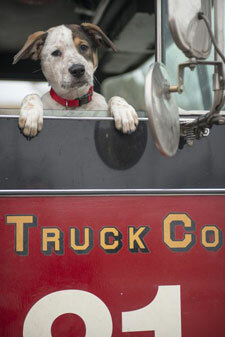 “All firehouses have a million stories to tell about a firehouse dog, and we thought he would make a great addition. Pouch will literally grow up before our eyes. Plus, pets are great stress relievers, and firefighters and rescue squads are under tremendous pressure every day, so they will appreciate her presence as a working dog,” explained Haas. Firefighter Peter Mills (Charlie Barnett) discovers a wayward mutt and wants to keep him in the firehouse, but is overruled by no-nonsense Battalion Chief Wallace Boden (Eamonn Walker) and Mouch (Christian Stolte). Over time, the irresistible Pouch eventually is named and claimed by the entire fire-and-rescue team.